At Forklift Truck Direct we pride ourselves on keeping up to speed on developments in industrial vehicle production. It helps us provide you with the best possible solution for your business. 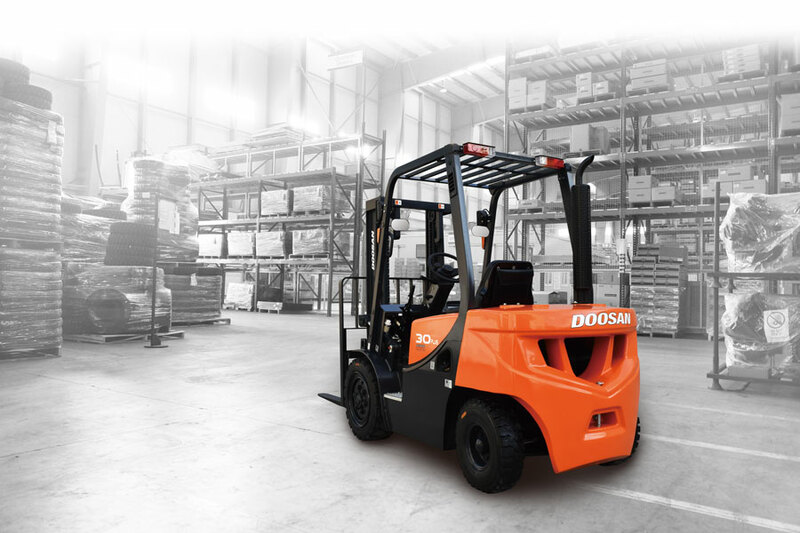 One inspiring company who we are very proud to be working with is Doosan, a manufacturer of reliable and robust materials handling equipment which helps our customers run efficient operations in with minimal down-time. As the leading independent forklift dealer for Doosan in the UK, we are delighted to share the latest technological developments in their vehicles. In line with their 50th anniversary, Doosan have unveiled a new line of eco-friendly, efficient forklifts with smart technology. This heralds an exciting new stage in the evolution of the forklift, suiting modern working environments without compromising on performance. Doosan are at the forefront of industrial vehicle technology and have 50 years’ experience producing sturdy and dependable machines. Having recently celebrated their 50th anniversary in the field, they continue to surpass our expectations. As industry leaders, Doosan constantly strive to improve the performance of their offering, combining efficiency with reliable design. Their latest fleet, which includes the new BS7 model, are state of the art, eco-friendly vehicles which run on lithium-ion batteries. The vehicles will offer superb performance and productivity at low temperatures and boast accessible maintenance and management. In addition, a new telematics system was unveiled, offering solutions for remote monitoring and management of equipment. All these advances mean users can operate more productive workplaces. Further plans to develop and release artificial intelligence-based applications were also announced. The premise is that the system will allow for forklift engine data to be analysed and adjusted automatically. Doosan plan to release the technology later this year as another step to provide their customers with high-tech industrial vehicle solutions. As we wait for these exciting products and systems to be rolled out across Europe, we continue to explore the benefits of existing and new technologies in industrial vehicles. We supply Doosan forklifts for purchase or hire and are keen to offer our customers the best value and performance for their money. Let’s look at the advantages these new developments could offer your business. The use of lithium-ion batteries in forklifts allows operators to work more efficiently, save money and improve their environmental impact. In the new Doosan BS7, a lithium-ion battery will charge 33% quicker and last up to 30% longer than an existing lead-acid battery. Less time on charge means more time in use, making your workflow more efficient and getting the best out of your employees and your business. This battery type also helps cut down on CO2 emissions, with the battery’s lifecycle up to four times as long as a lead-acid battery. This also helps to lower the number of batteries requiring disposal. The initial investment in the battery is higher, but the savings in efficiency, charging time and environmental impact more than compensate for the initial spend. Whether you operate one truck or thirty trucks, your business could benefit from telematics-based systems like the Lin-Q model announced by Doosan. Telematics is beneficial in material handling environments where it can provide additional data, help with health and safety, and increase productivity. It can monitor the usage of your trucks, let you identify training needs and reduce idle time and waste. Consider it a helping hand, providing information when you need it, but not overwhelming you with too much data. This won’t mean job losses, but improved knowledge on your business needs and how best to utilise your workforce. When you need a solution for your material handling business, you can depend on Forklift Truck Direct. For purchase, hire or maintenance enquiries, get in touch with our friendly, professional team today.